AIADMK general secretary Jayalalithaa swears in as Tamil Nadu chief minister at Madras University in Chennai, on May 23, 2016. Also seen Governor K Rosaiah. AIADMK general secretary J. Jayalalithaa, 68, was on Monday sworn in for the sixth time as the Tamil Nadu chief minister in a packed hall in Madras University as thousands lined up on the roads outside.she was administered oath of office and secrecy by Governor K. Rosaiah. Jayalalithaa will head a 29-member ministry in the 15th Tamil Nadu assembly.She was sworn in as chief minister for the sixth time in her political career.Jayalalithaa later went to the Secretariat here to sign some papers. 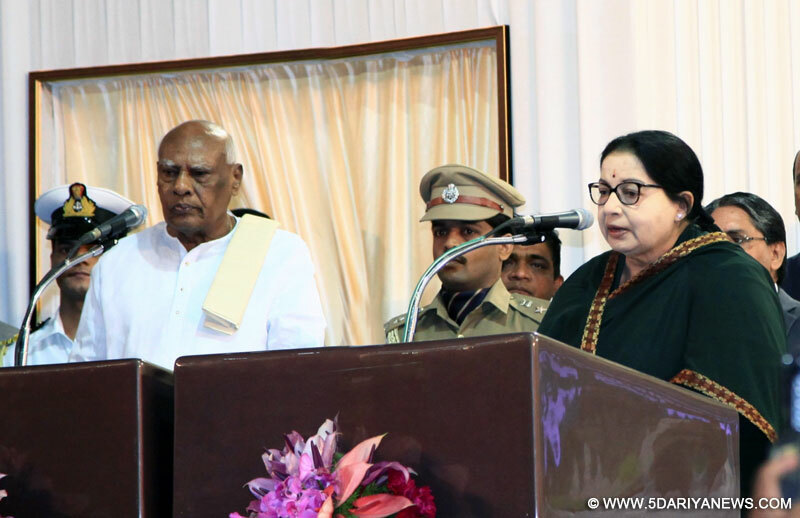 Rosaiah also administered oath of office to her council of ministers, days after the AIADMK-led alliance won the May 16 assembly election which saw a multi-cornered contest.Union ministers Venkaiah Naidu, Pon Radhakrishnan, DMK treasurer M.K. Stalin, industrialists and other personalities attended the swearing in ceremony. A large number of people gathered at the venue. People lined up along both sides of the road from Jayalalithaa's residence at Poes Garden through the stretch from Kamaraj Salai on the Marina up to Madras University campus.The AIADMK-led front won 134 seats in the 234-member Tamil Nadu assembly. AIADMK party cadres distributed sweets and cakes to celebrate the occasion.